Youth and beginner softball players may benefit from drills that teach them not to fear the ball. Many of these drills substitute a lighter ball for a traditional softball to make catching and throwing less hazardous. In addition, many such practice sessions focus on building a player's confidence. As a result, the appropriate drills often begin at short distances and feature low speeds. This drill is designed to improve your player's confidence as well as her ability to catch fly balls. Stand 5 feet from your player with your knees slightly bent and your glove on. Have your player mirror your position and wait for your toss. Start by gently tossing the ball to your player. Every time your player successfully catches the ball, have her take a step back. If she drops or misses the ball, repeat the same toss until she catches it. According to MySoftballCoach.com, as the player starts to improve, toss the balls to her left and right, forcing her to move her feet to make a catch. This drill will improve your player's form as well as his overall fielding confidence. Have your players line up at second base. Have one player step out to field the shortstop position. Make sure this player has his knees slightly bent as well as his upper torso slightly hunched over his body. Hit him a soft ground ball, using a light softball to reduce the potential for injury. Using the softer softball also allows your players to build confidence and not be afraid to make a bold play. Once a player successfully fields the ball, have him throw the ball toward first base to simulate throwing out a runner. This drill is designed to improve your player's catching confidence and technique. Go into your backyard or an open field and have your child stand 5 to 10 feet away. Have her throw her softball mitt onto the ground and prepare to field a grounder with her bare hands. 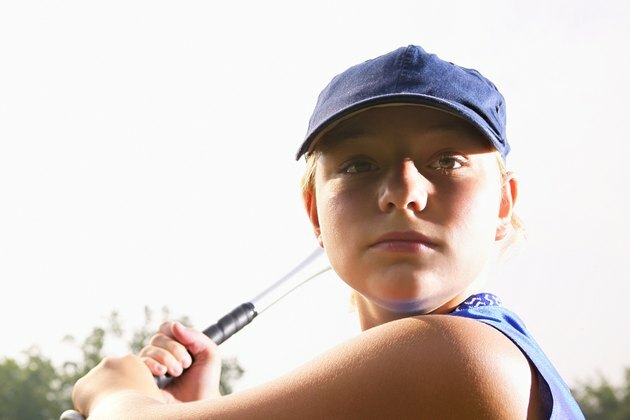 Although it might seem intimidating at first, getting your athlete to physically feel the ball with her hands is the first step to reducing her fear of the ball. Once your player has fielded several ground balls with her hands, have her take a few steps back and perform the drill from farther away. As her confidence improves, have her put on her glove and field the ball from different angles. Girls-Softball: My Daughter Can't Catch! Do Receiving Gloves Help You Catch a Football?